The winter issue of Cattle Breeder previews the Club's January conference and we are delighted to have lined up for this event one of our most diverse ever collections of speakers. Always with the aim of making science relevant to practical farming - reflected in the conference theme of 'Bringing Science to the Field' - we have brought together experts in many disciplines in the belief that they will enhance your business; broaden your industry perspective; and perhaps improve your bottom line. Included in the line up are representatives from the UK's largest retailer and an innovative online farmers' market; from academics specialising in marketing and consumer behaviour to prize-winning, grass-roots farmers; and from professional landlords to get-up-and-go tenants, all with tips on joining the farming ladder. Information on genomics will be right up-to-the-minute and come from a practical perspective, following last year's more academic approach - and include sight of the first ever publicly available genomic bull proofs. With the addition of key industry speakers - including NFU president, Peter Kendall - we feel sure we have a programme which will parallel that of 2008, when the conference enjoyed a record year. The conference is guaranteed an informal, down-to-earth and inclusive feel under the chairmanship of Paul Westaway, well known as a cattleman par excellence. For many years, Paul has worked in the field of Holstein genetics for which he has gained an international reputation, and more recently he has become a breeder in his own right, with a herd of Aberdeen Angus. In response to our recent growth, we have moved to a larger venue - the Telford Golf and Spa Hotel. The main dates are Tuesday 20 (beef) and Wednesday 21 January 2009 (dairy). Day rates are £80 for members (£105 non-members) while cost-effective packages are available to include accommodation and participation in all social events. Which lessons from pork are relevant for beef? It may be tempting for beef producers to close their ears to the lessons to be learned from the worlds of pork and poultry. Most of them know they neither want the large scale production nor the factory systems for which these industries are known. But can they afford to eschew a potential doubling in productivity - seen in the pork industry over the last 40 years? Ian Biggs, chief operating officer for Genus Americas thinks not. In his presentation, he will suggest how British beef producers can cherry pick elements adopted in these industries and apply them to improve their own levels of efficiency. And he'll add and expand on a further warning, questioning whether the messages sent by consumers - for traditional, family-farm and free-range production - are genuinely reflected in their buying habits. A lot of hot air has been emitted in the biofuels debate, but Richard Whitlock, who is industrial crops director for Frontier Agriculture - the UK's largest arable merchant and supplier to what will be the biggest single intake bioethanol factory in the UK - intends to get to the nub of the matter in his presentation. With some hard-hitting facts, he will dispel some myths that have dogged the development of the biofuels sector; he will outline how British farmers can best position themselves to supply this new industry; and he will outline opportunities that high protein co-products will present for feeding cattle. For those with a competitive edge who are there at the outset, he thinks the opportunities will be there for the taking. A remarkable 90 per cent of all beef carcases in the Irish Republic are graded mechanically, using Video Image Analysis, despite the fact that less than five years ago, all beef carcases were graded manually. Dr Tom Keating, an agricultural inspector with Ireland's Department of Agriculture, is well placed to speak on the transition to this technology - on how it has affected the farmer's bottom line and on why its uptake has been so rapid. British delegates at the conference may well be left wondering why the UK is lagging so far behind and what they will be missing if they fail to embrace this technology. For the producer who is yearning to take part in his local farmers' market but has neither the time nor resources to do so, Rick Sanderson would seem to be the answer to his prayers. Having worked in agriculture for 14 years, Mr Sanderson has now turned his attention to developing an online farmers market, which he is spreading throughout the UK by selling the business on a franchise basis. Delegates to the conference will hear how he is branding and supporting his franchisees who are each selling their region's produce through his website, and how the farmer is retaining a bigger share of the profits! This innovative business is deserving of the many awards it has accrued, while its developer can justly bask in his newfound status of 'local food hero'. The perennial problem of what to do with dairy bull calves is being successfully addressed by Linden Foods in Northern Ireland to the extent that the company has created from nowhere a thriving market in continental Europe for its rosé veal. With careful attention to rearing and marketing, they have more than quadrupled their weekly export of carcases in less than two years of trading and are seeking new suppliers as they optimistically plan for further growth in this trade. Frank Foster, the company's supply chain manager will explain to delegates how the success has been achieved and why the company has confidence in the sector's future. Westcountry beef, sheep and arable farmer, John Hoskin believes with a passion that farmers must get closer to their markets. Retailers want continuity of supply and a consistent type of animal and by committing his farms to deliver to their specifications he has a longer term assurance of price. In his presentation, Mr Hoskin will demonstrate - using examples from his own business -how co-operation at every stage of the supply chain can work for the long term benefit of profitable farming. As the managing director of the abattoir, Southern Counties Fresh Foods, Richard Phelps conceived the idea of a supply chain management business in an attempt to achieve a more regular throughput of cattle and to turn the 'dolly mixture' of animals arriving into consistent and high quality products. He has succeeded with a vengeance, as Blade Farming - the company he founded in 2001 - is now one of the largest beef farming operations in England with over 20,000 cattle currently passing through its system and a reputation for consistency and quality previously unimaginable on this scale. Mr Phelps will give an insight into how the business is structured; what he expects of and delivers to his suppliers; and why both beef producers and buyers - including McDonalds and Tesco - are keen to work with the business. With expansion ongoing into Northern Ireland, this is a Great British success story which has truly been implemented from the bottom up. With efficient supply chain management gaining added importance in the competitive market for beef, who better to address the conference than a representative from the UK's largest retailer and largest buyer of UK beef. Alice Pattinson, Tesco's agriculture manager for beef and lamb will emphasise the importance of delivering quality and consistency and explain how Tesco will continue to work within the supply chain to meet this goal. With an eye on conusmer trends and aspirations, she will go on to outline the direction in which the company is heading. Praised for his attention to detail, for fine-tuning rations and for careful selection when it comes to breeding, Philip Heard - recently selected as Farmers Weekly Beef Farmer of the Year - believes that if he has done his job correctly his cattle should sell themselves. His farm in Okehampton in Devon carries some 340 cows and 800 sheep, the cattle comprising a small herd of pedigree Charolais and an upland herd of Welsh Blacks, said to be ideally suited to grazing the Dartmoor Commons. Selling suckler calves in spring and autumn, he will tell the conference his keys to performance and profitability and how he plans to drive his business forward. Conflicting forces are pulling the beef industry in different directions. There's the need to feed the world; to promote good health; provide high quality and convenience foods; cut obesity; and farm in a sustainable and ethical way, with minimal greenhouse gas emissions. Professor Marcia Dutra de Barcellos from the Pontifical Catholic University of Rio Grande do Sul in Brazil and MAPP Research Centre in Denmark considers all of this and more in a broad-ranging presentation which will draw on the latest global consumer trends and suggest ways in which the British beef industry can innovate and adapt to secure its future in a demanding and fast-changing world. Will she suggest a middle way, or a bold leap into a new direction? The British dairy industry is facing a crisis of confidence. Soaring input costs, the credit crunch, NVZs and bovine TB, on the back of many years of under-investment have all conspired to produce a calamitous drop in milk production. Now more than ever, the recommendations made by the NFU in its 2005 Vision for the Dairy Industry are vital components in rebuilding the confidence of British dairy farmers to invest in the future. NFU president, Peter Kendall will provide delegates with the most recent NFU position and explain why he believes the fundamentals for British dairying remain positive. Switching from a 10,000 litre, North Wales herds competition-winning herd of pedigree Holsteins to some 330 non-pedigree Jerseys represents a bold leap of faith. But Charlie Whittingham - who farms in Ruthin in Denbighshire - has not regretted the decision. On the contrary - he has found the change has enhanced his lifestyle, improved his environmental credentials and increased his farm profits by almost £50,000. His presentation to the conference will reveal what lies behind these improvements and why they have earned him the title of Farmers Weekly Dairy Farmer of the Year 2008. The issues are familiar and the problems diverse. Overcoming a shortage of credit to finance expansion; making the most of non English-speaking labour and dealing with the transition from a manager of cattle to a manager of people as herds expand in size. All have resonance for British farmers, but they are equally issues confronting the American dairy industry. Former British dairy farmer, Brian Bolton - who has spent the last eight years working in the States and is now chief executive of Allflex USA - will give his personal perspective on how the US dairy industry is dealing with these and other farming problems and he'll leave you to decide what the UK can learn from the Stateside experience. Genomic selection in the dairy industry may appear to be having a roller-coaster ride as AI companies race to launch their product to the market with a science that is moving from theory to practice. As a board member for the USA's National Association of Animal Breeders (NAAB) Dr Marj Faust has been involved with the multi-million dollar project which is driving the technology's uptake forward and will bring to the conference the very first figures on publicly available genomic proofs for cows and AI bulls. With the USA's January 2009 proof run launched just a week before the conference, she will share new insight into how the technology is performing and what value it may bring to UK dairy farmers. Holstein UK celebrates its centenary in 2009 and will be launching its year of commemorative events at the conference. Simon Gee, the society's communications manager, will look back on 100 years of black and white breeding history, from the founding of the British Holstein Cattle Society in 1909, through many years as the British Friesian Cattle Society and more recently the merger between the Holstein Friesian Society and the British Holstein Society in 1999. A variety of influences have shaped the black and white cow throughout these years, to produce the high production animal we now see today, which remains the mainstay of British milk production. Drawing on lessons from the past, he will project a direction for the breed and the society as they both face a new set of challenges. Richard Rhone believes the 400-head dairy herd he manages at Wareham in Dorset is the acceptable face of intensive farming. Producing around 9,000kg on twice a day milking, the cattle have ample opportunity to graze yet are never exposed to the extremes of our climate. Believing that everything works - both cattle and people - provided the right infrastructure is in place, Mr Rhone will be willing to expose his costings to the delegates' scrutiny and argue his case for his own brand of relatively high input farming. Bill Jewell is in an excellent position to present the case for low input farming, running an extensive, low input herd - making the maximum use of grazed grass - on the borders of Devon and Cornwall. Producing a 4,500kg average from 900 cows, he will share with the conference the farm's performance and financial figures, and reveal how using well under a tonne of concentrates a year; minimising housing despite the clay soils; and converting to the organic way is best for cow heath, his personal satisfaction and for bottom line profits. As a partner with Andersons Consultants, Mike Houghton is well placed to give objective comparisons of profitability between high and low input farming. Using national data from the numerous herds he oversees under a variety of production systems - including the data from the herds run by the conference's extensive and intensive speakers - he will provide the rare commodity of impartial evidence of the merits of each approach. Viewing each system in a global context, he will predict whether intensive or extensive dairy farming has more chance of prevailing and prospering into the future. Securing a farm tenancy takes patience, perseverance and a good business plan, according to Charles Coats from Gloucestershire County Council. And he should know. As head of the Council's property services, he has responsibility for around 100 farms and 8,600 acres and regularly engages new recruits to take on the Council's farms. His presentation to the conference will not just be delivered from a landlord's perspective - offering advice on securing the best custodian for your land - but will also reveal the most important qualities a prospective tenant can bring. For anyone seeking their first step into farming, this could be the paper that helps them on their way. Mike Colwell only began farming in his own right as a tenant three years ago, but already has big ambitions - including the ownership of a 400-head herd of world-beating Jerseys - which he is well on the road to achieving. With some tips on how he picked up one of the biggest and best County Council holdings in Cornwall, he'll also highlight the greatest hurdles, the key requirements for the structure and operation of the farm, and why he is already keen to take the next step up the farming ladder. The industry lost a leader, innovator, friend and counsellor when noted cattle breeder, John Moffitt sadly died on May 6, aged 78. John had played a very prominent part in the British Cattle Breeders Club, of which he was president from 1997 to 2005. He was proud to have attended 41 of the Club's events, including his first conference in 1948 and his book of personal notes and observations reviewing this period was published in 2006. John not only established the Hunday herd of Holstein Friesians as a household name in the dairy industry but was also a pioneer in the dairy sector over many years. He was prominent in the Holstein Friesian Society and in many other organisations, including ABRO (the government's Animal Breeding Research Organisation), later the Roslin Institute, the Animal Data Centre, the Royal Association of British Dairy Farmers, the Milk Development Council (its first chairman) and the government's Engineering Research Institute at Silsoe. He was the main instigator and chairman of Premier Breeders Ltd (later taken over by Genus) - the first private AI company in the UK and pioneer of MOET (multiple ovulation and embryo transfer). 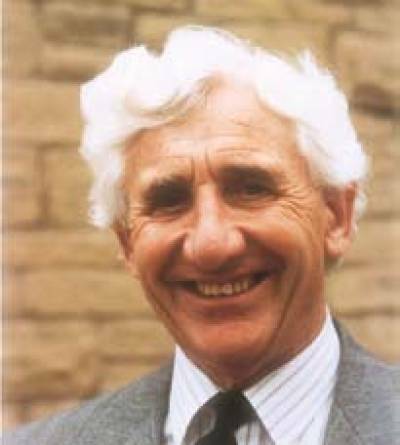 Amongst many awards, John was made a CBE in 1979 for services to agriculture and received the Princess Royal Award for outstanding service to the dairy industry. He was International Personality of the Year at the World Dairy Expo (USA) in 1994. He will long be remembered for his enthusiasm, leadership and good nature. A fuller appreciation will be published in the Club's next Digest. 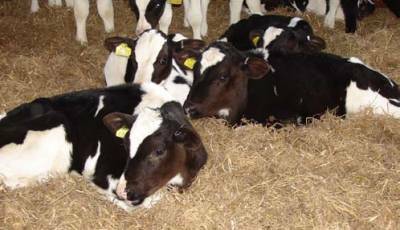 Recent research confirming the permanent growth setbacks caused by calf pneumonia and positive experience of combination lung protection therapy is causing vets to upgrade prescribing protocols Last year results from a major study conducted in association with Blade Farming - the UK's largest beef producer - confirmed that pneumonia-induced lung damage can cost some cattle almost 74kg a year in lost lifetime growth potential. It's a startling fact that has led the company to review pneumonia treatment protocols on all their beef production units. Rosemary explains that pneumonia infections can soon damage lungs unless treatment is rapid and effective. If prompt action is not taken pneumonia-induced lung damage quickly becomes permanent, which means that even if an affected calf survives it is likely to have impaired lung function and compromised performance for the rest of its life. However, market research has revealed that whilst 78% of vets in the UK routinely use an anti-inflammatory when treating cattle pneumonia, only 14% of cattle producers use one on farm. Discussions with vets in practice this autumn suggest more farmers are appreciating the value of NSAID treatment alongside an antibiotic that kills the bacteria causing the infection. It may be that the advent of combination therapy - where antibiotic and NSAID are administered via a single injection - is making effective treatment that much easier. Significantly though, both vet and farmer feedback suggests that combining the two components in a single formulation is working well on farm to deliver rapid animal recovery. For example, vets in practice who monitored 17 different pneumonia outbreaks around the country have reported interesting results. Clinically affected animals with an average temperature of 104°F and above experienced a mean temperature fall of over 2°F within six hours of treatment with the combination treatment Resflor (see chart below). Calf breathing and depression scores were also markedly improved within the same period. It is combination therapy usage experience that has led practitioners like Keith Cutler from the Endell Veterinary Group in Wiltshire to upgrade his pneumonia treatment prescribing protocol. Rosemary Booth says that the reason why this combination therapy is changing the pneumonia treatment landscape is the chemical ability of its formulation to deliver both NSAID and a 33% higher peak of antibiotic in the animal within six hours of treatment, compared with that from antibiotic alone. Recognition of this fact alongside the rapid and visible recovery benefits being reported on farm - together with the practicality of being able to administer antibiotic and anti-inflammatory in a single injection - is why combination therapy usage is becoming the gold standard treatment for calves showing pneumonia symptoms.